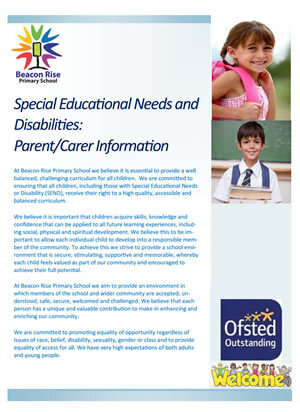 At Beacon Rise School we recognise that some children may require extra help for some of the curriculum while in school. This could be for academic, social or behavioural reasons. There are ongoing identification procedures for SEN as part of our continuous assessment. The Code of Practice for Special Education Needs provides a structure to support pupils in their learning. The process is detailed below. It is recognised that at any one time up to 20% of pupils may have a special educational need during their time in school. For many children this will only be for a short time, for others it may be for all of their school life. If our experience and expertise shows that a child may have special educational needs, we will discuss this with parents/carers. We have a good track record with supporting pupils with special educational needs. If you would like to speak to Miss Chambers or Miss Macdonald about your child, please can you make an appointment via the school office. We are happy to meet you. Should this prove insufficient please see our Complaints Policy.